Mon chéri, to your left feast your eyes upon Primp’s precious Horse & Saddle Thermal – the very same one seen worn by Vanessa Hudgens, Miley Cyrus, and Mischa Barton; to your right savor the whimsy that is Forever 21’s Unicorn Print Thermal. While it’s obvious that the fabulous Forever 21 piece is slightly different in the sense that it is bedecked in mythical unicorns as opposed to the whinnying horses of the original; for just $13.80, in comparison to the $79.00 price tag of the Primp pretty, it is the perfect way to add a dash of playful to your posh wardrobe – at a price that is simply magical for the frugalista’s wallet! Thanks to Cool Spotters and Forever 21 for the pictures. Eh... I'm just not a big fan of horses on my shirt. I'll pass. but thanks for sharing. made me a bit nostalgic. I love primp and have alot of thermals from them. Yes please to the F21! I could see that being a shirt I wear only a few times and then it becomes pjs because it is so recognizable. I want to save the big bucks for the repeat items (like SHOES). I think I prefer the F21 version! I like the Forever 21 shirt. Honestly, I love Forever 21 better! i'd definitely go for the f21 one, it's just too cute!! I like the unicorn figure better than the horses! So cute! I'm going to have to choose neither. It's the horse. I would love to wear just a pink shirt, but not one with horses. Hope you have a good Sunday, Erika, and I hope you've been having a great year so far. Hahaa, these are adorable! I like the Forever 21 one more though! Great post! I actually prefer F21's version! Check out my blog, I recently did a post on a Splurge vs Steal on Hermes bracelets and look-alikes! these are so cute!!! 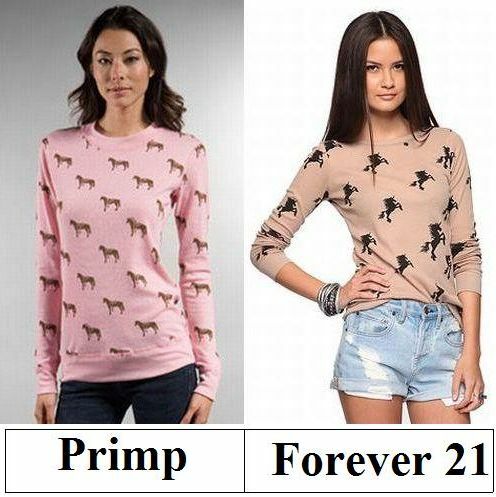 but i'm in LOVE with the forever 21 one over the primp!! and what a savings!!!! So adorable! I definitely like the color of the Primp version better but for that price I'd have to pick the F21 version. What a great find at Forever 21! Those are cute! While I like the Primp one, Forever 21's fits my budget better. I adore the one from forever 21! Again: You are so good at finding less pricey things that look so alike! And thank you so much for all your sweet comments darling. Have a great day. That's the kind of thing that you definitely do the cheaper version for. My mom calls them "disposable clothes". Kendra at closet confections wore it last week and she made it look awful cute. I adore this unicorn printed thermal. I'm a unicorn lover, because they DO exist. :) hee hee. Hope all is well! Swing by to enter my Wendy Mink Giveaway!! That is such a pretty print. It's such a cute girly jumper. I love the F21 one: the colour is so pretty. I can admit it, I am a f21 addict! i want that horse shirt, it is so cute!! I think I like the f21 shirt better! it's adorable..I love the print. I actually like Forever 21's version better!! Forever 21 this time, for sure. I would wear it with a tiara. Not a fan of either (this looks too much like a pajama top), but there's no way I'd pay $79 for this! I want to be femme fatale... the lethal lady! awww the f21 version looks even cuter! i need to get one of those! The F21 one is absolutely adorable! I absolutely love the fun print. I don't think I could carry off this one. I might be too age challenged. HA!